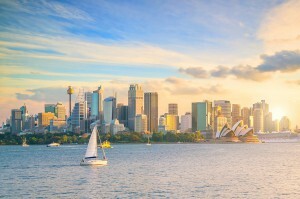 Sydney is one of Australia’s 2 super cities. If you were an overseas visitor coming back after 20 or 30 years you just would recognise our Harbour City – it has changed so much. One of the big changes is how many Sydneysiders live in apartments. The demographers at McCrindle recently analysed the changing demographic characteristics of Sydney’s apartment dwellers which sheds light on their lifestyle choices, habits, motivations and reasons for choosing apartment living. And their forecasts of what’s likely to happen to apartment living in Sydney is important for investors to understand because to be successful in property investment it will be critical to own the type of property that will be in continual strong demand in the future. So let’s look at how the lifestyle of Sydney apartment dwellers has changed. McCrindle explain that in 1991, the population of Australia had just surpassed 16 million. The median age was 32 years old and median individual income was just $13,950 per annum. More than one in three (36%) Australians lived in New South Wales where individual income was slightly higher at $14,395. Home owners in New South Wales paid a median monthly mortgage repayment of $627 while renters paid just $128 per week. The population in Sydney had reached 3.1 million, growing steadily at a rate of less than 1% each year. Less than one in ten (9%) were living in medium density housing (i.e. row or terrace housing). In the early 1990s detached houses were mostly homes for families with children (60%). The second most common detached home household structure was couples without children (22%) followed by lone person households (12%). Apartments, on the other hand, were most likely home to lone persons. Two in five apartments were occupied by a lone person (41%), followed by families with children living in apartments (23%) and couples with no children (21%). Fast-forward and today Australian population just hit 25 million. Our median age is now 38, both nationally and in New South Wales. Median personal income in New South Wales has reached $34,528 per year. Median mortgage repayments have more than doubled at $1,986 per month. Median rent has nearly tripled to $380 per week. In Sydney’s urban centre, the resident population has grown to 4.4 million, at a rate that is twice as fast as in 1991 (2% per year). Sydney householders who own their home with a mortgage (33%) face a growing affordability crisis. One in 12 families (8%) are experiencing mortgage stress (with mortgage repayments greater than or equal to 30% of their household income) and a further 14% face rental stress (paying more than 30% of their income to a landlord). Combined, 22% of Sydneysiders face significant housing affordability challenges. That’s more than one million residents. Sydneysiders have been trading traditional detached homes for apartments at an increasing rate. Over the past five years the number of occupied apartments has grown by 17% while the number of traditional houses has seen little change (0%).